In a small mixing bowl, whisk together the 3 Tablespoons water and the flax meal. Set aside. In another small mixing bowl, whisk together the warm water and the yeast. Allow the mixture to sit for about 10 minutes so the yeast activates. Add the flour to a medium mixing bowl. In another medium mixing bowl add the sugar, Vegan Butter, salt and whisk until well incorporated. Add the flax meal mixture from Step 1 and the yeast mixture from Step 2 to the bowl containing the sugar and Vegan Butter mixture. Whisk until well combined. Add these wet ingredients to the bowl containing the flour and stir until the dough comes together into a sticky ball. Lightly dust a clean surface with flour and knead the mixture for 5 to 10 minutes. The dough should be firm and smooth, not sticky. Place the dough back into the mixing bowl, cover and place in a warm place like on top of the stove for 1 hour. After 1 hour has passed, knead the dough for about 30 seconds and let it rest for 10 more minutes. 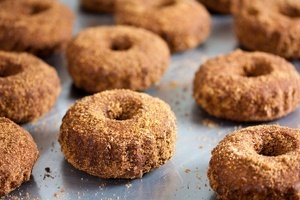 In a small bowl, whisk together the brown sugar, Vegan Butter, maple syrup and cinnamon. Set aside. Roll the dough into a flat 16 x 20 inch rectangle. Spread the Vegan Butter, sugar and cinnamon mixture evenly on top using a dough scraper or spatula. Carefully roll up the dough lengthwise so it's 16 inches long. Cut it into 1 ½ inch sections with a sharp knife. Preheat the oven to 400F (204C). Place the rolls close together, cut side up in a lightly greased 9x13 glass or ceramic baking dish. This will ensure that the rolls don't unravel during baking. Sprinkle the walnuts and raisins over them. Cover with plastic wrap and let the buns rise for one more hour. Prepare the Vanilla Icing and set aside. Bake until the cinnamon rolls are just starting to turn golden, about 15 minutes, rotating the dish halfway through the baking duration. Pour the icing on the warm rolls before serving. You may want to heat the icing up a little so it can easily be poured. This recipe makes about 12 Sticky Vegan Cinnamon Rolls. Get a price on the 9 x 13 Inch Baking Dish I Recommend at Amazon. i am not quite sure i understand step 10...if i preheat my oven to 400 with the rolls in a glass baking dish and cover them with plastic wrap, i am assuming i am suppose to keep them on the stove to rise as opposed to putting them in the hot oven where the plastic wrap will melt to the dough and ruin them. is this correct? Pre made these on Christmas Eve and kept in fridge uncooked till the morning. They rose beautifully in the oven and had rave reviews from my vegan sisters, thanks bunches! Plus my meat/potatoes hubby gobbled them up too! Best breakfast ever! BEST cin rolls I have EVER made, vegan or not. I combined steps 5 & 6 and after mixing vegan margarine with the other ingredients as listed, I put the flour in my bread machine, then the margarine/yeast etc mixture, then let the bread machine do the work. After it rose I continued with the recipe as written. PERFECT!!! Sharing this recipe with everyone!! Thanks! Just made this delicious cinnamon buns and were a hit; my kids really loved them. Thank you for the recipe. I was expecting a lot from this recipe (I did the vegan butter this morning and it turned out very well) and I would have rather keeped the butter for something else..
And yes, I followed everything to the letter. Excellent!!! Thank you so much for an amazing vegan cinnamon roll recipe! It made our Christmas morning complete! Hi there! So excited to try this recipe- I will be making these for my 20-years-vegan boyfriend on Christmas morning. Is it possible to make the dough ahead of time and have it in the fridge overnight to save having to get up at 6am? If so, at what point do I stop and put the dough in the refrigerator? Thanks!! 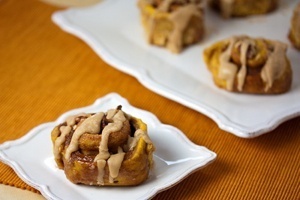 Just like non-vegan cinnamon sticky buns, but... way, way better. No one could tell they were vegan! Instead of yeast: (cause I didn't have it) I used equal parts of baking soda and lemon juice to equal the amount of yeast needed. (if you're gonna do it this way, make sure to add it in LAST to get the best results; plus using this method you don't need to leave the dough to rise, so yay to wayy less prep time!) and added the water that was supposed to go with the yeast. I make breakfast once a month for my club and these are always a huge hit. 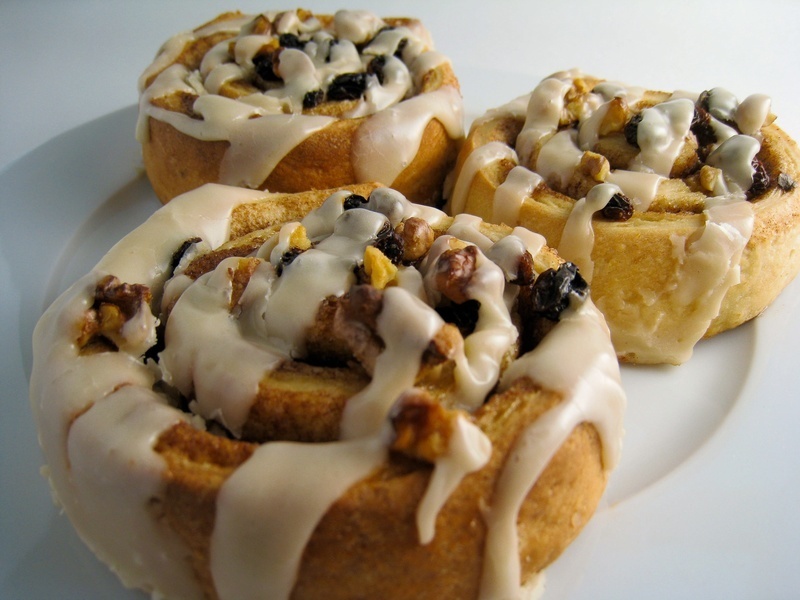 I have tried other cinnamon rolls but these have such a great taste they are requested often. Thank you SOOOOOOO much for the recipe. If my tweaked recipe ever goes up on a blog (thats been a WIP for a while now), I will be sure to link back to you as my inspiration. So glad you enjoyed the cinnamon rolls Sneha! Thrilled that they passed the kid test! Looking forward to checking out your blog. My advice to you is, work on it a tiny bit every day or so. Then before you know it, you'll be all set! I followed your instructions to a tee and, voila, the outcome was just perfect! This is coming from the unluckiest baker in Canada, where everything always burns or tastes like crap. I served them to my dad this morning, and he said you couldn't get better chelsea buns from a bakery (and he's not one to sugar coat a compliment). These were truly perfect, in every way. Even my boyfriend, the devout non-vegan, loved them. There's no difference to non-vegan rolls. And the flax meal... my gosh, what a great egg alternative. Thank you! A bit expensive, but you don't really need that much of it, so I'm happy. Your website/blog (whichever) is awesome! I only discovered it yesterday, but I know I am going to come back again and again. Thank you!! So happy the cinnamon rolls worked out so well for you marick22! Thanks so much for sharing! That right there took about 3 hours but it sure was worth it! I think that the taste is better than any cinnamon rolls! Sometimes you just need to spend a few hours in the kitchen;) So glad the Cinnamon Rolls were worth it Malcolm! Thank you, worth the wait!!! I subbed 1.5 c of whole wheat flour, 2 tsp instant yeast, and skipped the raisins. 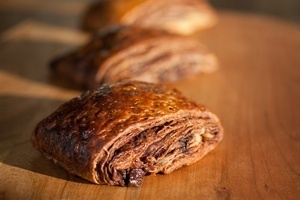 Next time I will increase the cinnamon in the filling, too. I used the exact rise times although maybe with instant yeast I could have shortened them. The rolls didn't seem done at 15 minutes and even at a little over 20 minutes when I took them out, I didn't see much browning (maybe because ww flour was more brown to begin with), but they are definitely done - next time I will take them out at 18 minutes. The walnuts on top got a lovely toasty flavor. My filling also ran out and covered the bottom of my dish, but the rolls still taste great! I just bookmark recipes I like, so if you find that tapioca or something keeps the filling from running out, I'll use your updated recipe. My husband kept asking when they would be done - and I really hoped after what was a long time on a recipe for me that they would be worth it... and they really are!!!!! Thanks so much GreenTrees! I suspect the filling slipped out during the additional 5 minutes of baking. Great idea to add some tapioca starch to the filling to keep this from happening in the future! If this proves to be an issue for you or future bakers, feel free to mix perhaps 1 teaspoon tapioca flour into the filling mixture. If it proves to be successful for people I may update the recipe. In the meantime, I've updated the recipe to bake until "just starting to turn golden", instead of "golden brown" which is what was stated previously. Thanks so much for your feedback! I'm relatively new to vegan cooking and although I have some baking experience, I had never baked rolls from scratch before. I was bold enough to use a group of non-vegan friends as guinea pigs, but these didn't disappoint... The result lacks nothing short of the regular kind, and definitely beats the commercially produced ones. I followed every step of the very clear instructions, except that I refrigerated the rolls overnight after putting them together in the dish. Next morning I just left them get up to room temp for about 40 minutes before I popped them in the oven for perfect results. There would be a few things to keep in mind for the next time: I could have gone with only half the delicious vegan icing. I will make sure to sprinkle my working surface with flour before rolling out the dough, for ease of handling, and probably will roll the dough thicker for the same reason. Great job! Thanks for the extra tips corremorrocoyo! So glad the cinnamon rolls worked out well for you. The dough was unworkably tough, had to add coconut milk late and it didn't rise very much. They taste great though. Once again, these recipes do not disappoint. They were chewy, sweet, warm, puffy, LARGE, amazing. My entire family of non-vegans made the batch disappear before the end of the day that they were made. I can't wait to make these again- and neither can they. I do have a question, though. During the initial steps of combining the butter, sugar, and salt with the flax meal and non-dairy milk, something strange happened. When I combined all of these mixed ingredients with the activated yeast and water, I think the butter solidified, leaving strange "clumps or strings" of a white buttery substance. How can I prevent this? At the end of the day it did not affect the rolls, but I can't figure out what I'm doing wrong. Glad these worked out Amanda! The white streaks do sound peculiar. If you're using melted Vegan Butter, or even a commercial margarine, and mixing it with the other ingredients, the warm water/yeast mixture should definitely be enough to keep the butter from resolidifying when it's mixed in. The mixture would have to be ice cold to get the melted Vegan Butter to resolidify and even then it would have to sit still for awhile for this to happen. So I'm thinking that these white streaks my not have been solidified fat, but perhaps something else. Yeast clumps possibly? Thanks for the feedback! Thanks for the recipe. I have never made any kind of cinnamon rolls before, but it's a family tradition for Christmas and since I went vegan... I thought I'd give these a shot. My brother had his wife make a regular recipe and these were preferred over the "regular" ones (he didn't sample mine). My mother-in-law let me know today that when I make them again, she'll help me eat them and that was after tasting it when it was 2 days old! I did not use your icing recipe, but the cinammon rolls came out perfect and my neighbor just asked for the link to the recipe. I'm leaving it to prove now and so far, I'm not convinced. The dough is very heavy and hard to work with. My poor KitchenAid was groaning. I really prefer a much lighter dough, but perhaps I need to follow some of the advice here (egg replacer, adding ingredients in different order). So disappointed, didn't turn out very good :( Once they were baked it was like they didn't cook all the way thru, so I put them in for a few more minutes. I'm thinking the yeast didn't active properly. I haven't made anything with yeast for many years but I thought you had to first mix the yeast with warm water and then add to the flour? Thoughts? These were fantastic! I made a substitute of the equivalent of 2 eggs worth of egg replacer. I made the dough in my bread machine for the first rise, wet ingredients first, then flour, then yeast on top. Came out perfect! I also omitted the nuts and raisins as we're just not big fans. In the filling, I added a tablespoon of tapioca flour after reading other reviews that the filling leaks out a lot, and I used half the maple syrup. The filling was hard to spread but it seemed to help things stay inside! Lovely flavour, next time I will be adding even more cinnamon though. This is a keeper, my family had no idea it was vegan and I'm making these for our Christmas morning treat this year! THANK YOU! Wonderful! I just brought these to a potluck and they were a hit! I made them half whole wheat and made a different icing recipe due to ingredients I had on hand. I also made the dough in my bread machine. 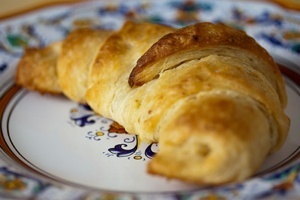 I've already emailed someone a link to the recipe and I will definitely make these again! Wow! This is my first time making cinnamon buns and this is superb! I didn't have flax meal so I used an egg replacer. Turned out great! So moist and chewy! Delicious! Amazing.. Best I've ever had even on day 2. My husband and son are not vegan like myself of my daughter and LOVED them. It's a great recipe and I've had no problems what so ever during baking. Mattie, thank you so much. I've now tried 4 of your recipes and they all have been great! Glad my track record is doing so well with you Rayna! ;) Awesome that your family loved these so much. These sure looked magnificent, but I was disappointed in a couple of aspects. The dough is excellent. When I made the filling, there was nowhere near enough to cover the rectangle. (I was following your instructions precisely, so I measured the dough to 16x20) My solution was to bulk it up with more 'butter.' I also added more cinnamon, 2.5 tsp seemed light. I carefully covered the surface, though I recommend using a rubber scraper or an offset spatula rather than spoon. Anyhooo. I baked them in a metal pan lined with a silicone sheet. I usually stay away from glass as it's a poor conductor of heat, and I wasn't worried about even cooking because I was using the convection setting in my oven. They came out looking incredible. I used a reduced amount of coconut oil in the frosting (I was low having just made some vegan butter :) ) and was glad of that because I prefer a less viscous result from using just the milk. The thing was, when we dug into them, there was virtually no filling inside. It had either been absorbed somehow or leached out. There were in fact puddles of caramel on the silicone sheet. That said, my husband thought they were delicious, and they were really good. Next time I think I would actually cut back on the butter in the filling. Do you think that might keep the filling from sliding out? Thanks so much for your input Andrea! I've updated the recipe to call for a dough scraper or spatula to spread the filling onto the dough because it would work better than the back of a spoon. The filling is on the scant side of things in these cinnamon rolls because if you add more it tends to do exactly what happened in your experience- to drain out during baking and caramelize at the bottom of the pan, gluing the cinnamon rolls to the bottom (in the absence of a silicone baking mat of course). I'll definitely make these again and see if I can increase the filling to the point of where the maximum amount can be added before it drains out. I'm having the exact same issue on a sticky bun recipe I'm currently working on. Perhaps adding something in the filling such as arrowroot or tapioca starch would thicken it up during baking before it can slide out? If you get a chance to play with this before I do, please report back with your results! My goal is to make this Cinnamon Roll recipe the best, this side of vegan! Thanks again for taking the time to write such a detailed review! Made these rolls today. They are pretty time consuming, but SO worth the work! I did use 3 cups all-purpose flour and 1 1/2 cups white whole wheat flour, and they turned out just fine. I will continue to add a bit more whole wheat flour each time I make them, so I won't feel quite so guilty eating them! The frosting will be my new "go to" frosting, as I really like the taste the coconut oil gives it. So glad you liked these Sue! I love how a little bit of coconut oil can really deepen the flavor of vegan desserts. It's our 'butter'. Please report back and let everyone know how far you get with the white whole wheat flour substitution. It would be great to find out! This was a tray of sweet, moist, rich rolls! we are definitely making this again. Thank you for the recipe and the great work!